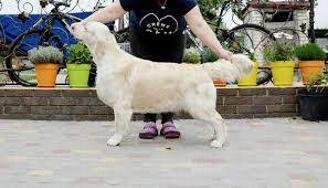 Jabari, CGC has an impecable pedigree. So many champions it is hard to count them all. This foundation and her award winning personality makes her a rock star addition to our breeding program. Can you tell how soft and beautiful Jabari's fur is? It lays beautifully and is much whiter in person. Jabari, CGC thinks she is helping me to clean up wood I just cut. She is so sweet. Take a look at just a few of her relatives. IMPRESSIVE! Golden Girls Kennels® hand raises all of our golden puppies to ensure that the best personalities and temperaments are developed. For further information on our golden puppies for sale please contact us.